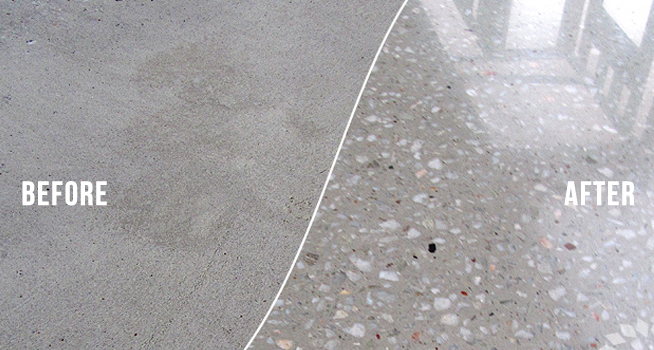 Concrete Polishing is, relatively speaking, a very new and modern-day option when considering flooring systems. Practically an unknown flooring option not long ago, diamond-polishing technology now makes it possible to grind and polish concrete surfaces to a mirror like finish. For nearly a decade, Superior Floor Coatings has provided complete concrete polishing service, care, and maintenance to both residential and commercial customers throughout Port St. Lucie and the surrounding areas. Using only proven methods that deliver results, and the most effective and advanced tools available today, Superior Floor Coatings is the best solution for concrete polishing services. Superior Floor Coatings offers the Highest-Quality, Durable, and Moisture Controlled Industrial Flooring. Saving money, while improving both appearance and workplace efficiency is your goal. We are here. Industrial floors should always be safe to allow firm footing for your employees on the floor. With our services, you can focus on your business, you will have peace of mind that your vigilance to safety has been met –and never have to worry about a dirty, hazardous concrete floor. Concrete polishing is the solution to your Warehouse Manager’s concerns about floor conditions, and Superior Floor Coatings is the # 1 option in the Port St. Lucie and surrounding areaa for the best concrete polishing available in Florida. Superior Floor Coatings is the top choice for best results within a firm budget. Retail customers ARE your business. We will maintain the luster of your concrete floor throughout the constant foot traffic! Using Superior Floor Coatings as your Preferred Vendor for Retail Concrete Polishing in Port St. Lucie and surrounding areas is a wise (and safe) decision, as we are long-established as the leading concrete polisher in Port St. Lucie. In retail – your flooring IS your integrity – Do not trust your integrity to amateurs or to a pop-up bargain-rate discount service – trust the experts. We are devoted to public/customer flooring and walking safety, and our products and service reflect that motto. In addition – aesthetically, our results cannot be matched. We maintain the new Concrete Floor luster, gloss, that lets your customers know you care. Superior Floor Coatings helps your Office, Loft-Space, or Commercial Space maintain its non-slip coating, and hold its durability throughout the life of the floor. Our services add veneer and shine to your floor space, and extends the “like-new” appearance for years. Using our long-established expertise, as the leading concrete polishing company in Port St. Lucie and surrounding areas enhances the Longevity, Durability, and Aesthetic Value of your concrete floor – for the long-term. For your concrete-based retail floor polishing needs, you will want the highest quality and the most cost-effective solution. Call us at Superior Floor Coatings! We are the best because we treat each client as if they were our FIRST client. We are cost-effective, the quality is top notch – explaining why we have been in business for so long. We lead the way and set the standard for retail concrete polishing in Port St. Lucie and surrounding areas. Choose Superior Floor Coatings to protect your warehouse concrete floor polishing needs. We are long-established as the leading concrete polisher in Port St. Lucie. Protect your floor staff, forklift operators, and hard-hats. Our floor polishing services use chemical resistant coatings, easy to clean products, and enhanced moisture control systems. Trust the industry experts for concrete polishing in Port St. Lucie. Do not waste your time or budget with amateurs -we get it done right the first time and every time with minimal interference and disruption to your Warehouse and operations. From the Foreman to the Loaders, no one should have to worry about footing. There is too much work to do. Trusting Superior Floor Coatings is always the right choice to ensure optimal safety and concrete floor longevity. We are the proven leader for concrete polishing in Port St. Lucie – and our results will speak volumes. Superior Floor Coatings guarantees all of our work and we are 100% committed to your satisfaction. Contact us today to get an estimate for your Concrete Polishing Contract and ask about all of our products and services.